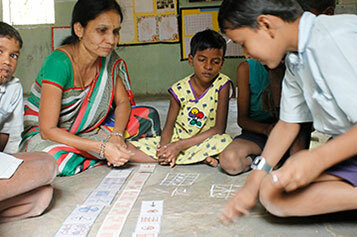 Grammangal believes that learning must be a process and not the end result. Teaching-learning methodologies, which are based on the fundamentals of constructivism, address the local context and are aimed at developing the whole child. For this purpose, the student is placed at the center of the learning process and encouraged to make meaning of its learning, and build on it to learn more. How the child learns is more important to us than what it is taught. The teacher does not teach. Rather, his/her role is to facilitate the learning process by providing varied experiences for the student to learn from. Learning activities are age and learning need-appropriate, and grounded in the context of the world around the students. The learning environment is inclusive; every child is an important part of it. Students learn in groups. Through group activities, they learn how to get along with one another. They learn empathy, trust and to care for each other. By trusting each other, they learn to collaborate. Children are no longer passive listeners. They learn more, enjoy the process and are actively involved. Constructivist methods encourage thinking and understanding instead of rote memorization. They engage the creative instincts develop students' abilities to express knowledge through a variety of ways. In a constructivist classroom students learn to organize their learning methods which they can carry to other settings. The students are also more likely to retain and transfer the new knowledge to real life. Constructivism gives students ownership of what they learn since learning is based on students' questions and explorations. A constructivist classroom promotes social and communication skills by creating an environment that emphasizes collaboration and exchange of ideas.